January 11, 1994 – The Irish Government announces the end of a 15-year broadcasting ban on the IRA and its political arm Sinn Féin. 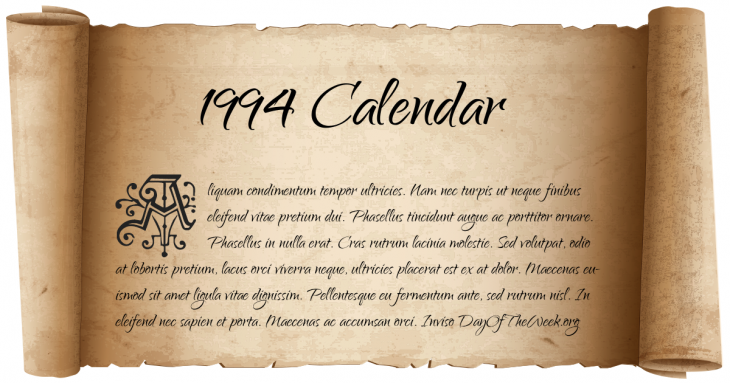 February 10, 1994 – New Year’s Day in Chinese calendar. Start of the year of the Wood Dog in Chinese astrology. March 7, 1994 – Copyright Law: The U.S. Supreme Court rules that parodies of an original work are generally covered by the doctrine of fair use. April 27, 1994 – South African general election, 1994: The first democratic general election in South Africa, in which black citizens could vote. The Interim Constitution comes into force. May 4, 1994 – Israeli Prime Minister Yitzhak Rabin and PLO leader Yasser Arafat sign a peace accord regarding Palestinian autonomy granting self-rule in the Gaza Strip and Jericho. May 7, 1994 – Edvard Munch’s iconic painting The Scream is recovered undamaged after having been stolen from the National Gallery of Norway in February. May 24, 1994 – Four men convicted of bombing the World Trade Center in New York in 1993 are each sentenced to 240 years in prison. October 31, 1994 – An American Eagle ATR-72 crashes in Roselawn, Indiana, after circling in icy weather, killing 68 passengers and crew. December 11, 1994 – A bomb explodes on Philippine Airlines Flight 434, en route from Manila to Tokyo, killing one. The captain is able to safely land the plane. Who Were Born On 1994?